Control your garden lighting from your smartphone or tablet! 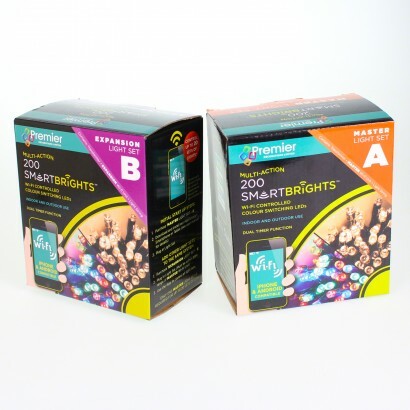 Smartbright string lights give you the power to control functions, brightness, timer and the speed of your garden lighting all from one clever little app available from Google Play and the App Store. Install the master LED light set first for a 20m run of pretty LED fairy lighting that can be set to white or multi coloured and then set the functions, brightness and more from your phone. Install expansion sets for further 20m runs of lights around your home or garden using the app to set all of your lights to come on at the same time and follow the same sequences, even shining with the same brightness for stunning effects. Brilliant for creating decorative lighting displays around your home and garden, each master light set and further expansion set has it's own transformer and wi-fi unit giving you the freedom to decorate individual areas without running wires linking each set and then co-ordinate your effects; simply use the app to control up to twenty sets of lights! Use expansion set to add further 20m runs of fairy lighting (please note that master set must always be used first and that expansion sets will NOT work without the master set). 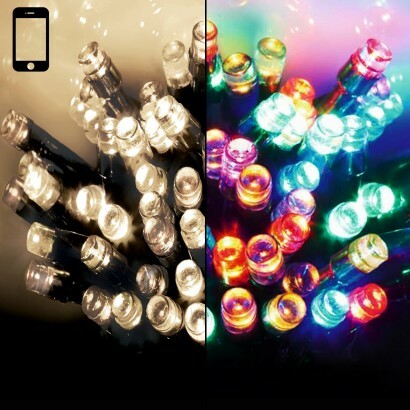 Control up to 20 sets of lights from your smartphone or tablet!